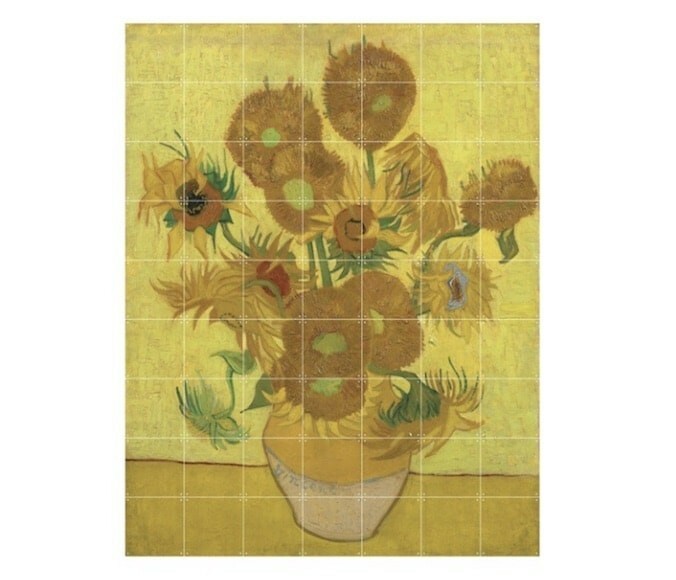 Attach your own Sunflowers by Vincent van Gogh to your wall. The IXXI wall decoration Sunflowers set consists of 20 torque crosses and printed square-shaped cards. Easy to set up and can be attached to a wall without using nails. With IXXI, you can easily create your own wall decoration. An IXXI wall decoration Sunflowers consists of torque crosses and printed square-shaped cards. These square-shaped IXXI cards are made of synthetic paper (Synapse) and are 20 cm wide, 20 cm high, and 0.3 mm thick. The cards are UV and water resistant and can easily be changed or expanded upon. During 1888 and 1889, Vincent van Gogh lived in Arles, southern France. There, he made a series of five works with sunflowers. The paintings were used by Paul Gauguin, a good friend of Van Gogh, to decorate his bedroom. Today, they can be found in five museums in as many countries. This wall decoration is based on the vase with fifteen sunflowers exhibited in the Van Gogh Museum in Amsterdam. Van Gogh was born in the Netherlands and would later live in Paris and other places in France. He did not have such a happy life and people in his lifetime disliked his beautiful paintings. In all his life, he managed to sell only one of his paintings. He earned no money and remained forever dependent on his parents and brother Theo. He takes to drink and is eventually admitted to a psychiatric hospital. In 1890, he decided - on the advice of his doctor - to concentrate on painting and he made his final series: On July 29, 1890, Vincent van Gogh dies and leaves behind more than 850 paintings and nearly 1,300 works on paper. IXXI comes as building kit in a compact box. The box contains 20 cards (Small) depicting parts of the Sunflower painting, torque crosses, and a suspension system. You can easily attach the IXXI with Van Gogh's Sunflowers to a wall.